The Veterinary Nurse is a clinical, professional and educational journal created especially for enthusiastic veterinary nurses looking to extend their knowledge in the field. 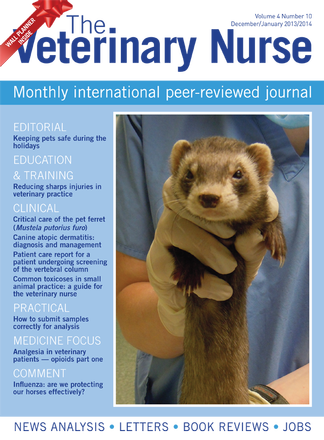 This international peer-reviewed journal written by fellow veterinary nurses covers the full range of therapeutic areas and topics, including education, clinical, practical and management issues. The Veterinary Nurse is passionate about supporting and championing veterinary nursing, which is reflected in the high-quality content and topical articles inside every issue. Articles within The Veterinary Nurse encourage veterinary practitioners to discuss, debate and improve their clinical practice. Be the first person to tell us what you think about The Veterinary Nurse and you'll save £2.50 on your next purchase!